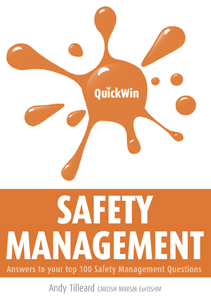 QUICK WIN SAFETY MANAGEMENT is also available as an iPhone app. Small and medium sized businesses will benefit from reading a new book, QUICK WIN SAFETY MANAGEMENT, by Irish-based chartered safety and health practitioner Andy Tilleard. The book also offers larger organisations with professional safety managers a useful refresher on why and how health and safety should be managed. What sticks in the reader’s mind about the book is that it eschews the legalistic approach and looks at health and safety from a management principles perspective. It is often said that the principles of health and safety management are the same the world over. That is how the author approaches the subject. His objective is to get readers to focus on health and safety and how it should be managed. But while he avoids references to legislation, except by way of example on a few occasions, he does point out to the reader the need to be aware of legal duties. The book is laid out by five themes: policy; organisation; planning and implementation; evaluation; and action for improvement. In the introduction the author says that the book has been written to be dipped in and out of, as one seeks answers to questions. To help the reader do this, the author has provided a useful grid, which the reader can use to search the book for answers under topic headings, such as contractors or standards. The author adopts the International Labour Organisation’s Guidelines to Occupational Safety and Health Management Systems – ILO-OSH 2001 – as the base model on which to build a safety management system (in a definition he makes it clear the word ‘safety’ encompasses ‘health’). He chooses the ILO model in preference to other systems, because it is recognised universally. It is easy to read and it deals with real safety issues. What is more real than, say, permit-to-work systems? Well, perhaps noise, fire, work-at-height, and control of contractors – just to mention a few of the issues covered. Beyond that, there are new things to be learnt or recalled to mind. The ideas of hazard registers and bridging documents are examples.